The only UK festival to be devoted entirely to living composers, the Vale of Glamorgan Music Festival gives audiences a chance to experience a wide variety of contemporary music in some striking venues in the Vale of Glamorgan, which is the area West of Cardiff. This year the festival runs from 19 May to 26 May 2017 and there are six world premieres (two from the Welsh composer Guto Puw), including four festival commissions, as well as a UK premiere of John Adams. Music Theatre Wales will be presenting a new Welsh language opera, Y Twr (The Tower) by Guto Puw with a libretto by the Welsh poet Gwyneth Glyn based on the classic 1978 play by Gwenlyn Parry. In addition, Puw's new work for fairground organ and brass will be premiered by Onyx Brass as part of a concert at the Eastern Shelter, Barry Island, in a programme which also includes the premiere of a new arrangement of John Adams' China Gates, and music by James Maynard, Stuart MacRae, Joe Dudel, Tim Jackson and Michael Berkeley. Onyx Brass will also be giving free concerts along the Vale of Glamorgan coastline. Guto Puw's work for Onyx Brass is a replacement for a commission which was originally offered to the late Peter Reynolds. Peter Reynolds was a long time supporter of the festival, and The Peter Reynolds Composer Studio is being created in his name supporting the development of eight composers in the early stages of their career. 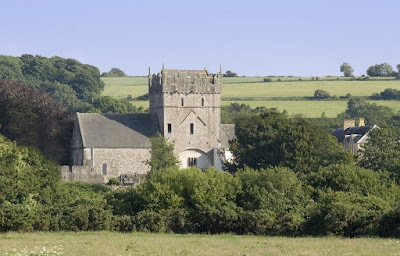 The Marsyas Trio will be performing a programme of music by women composers Gates of The Soul: Celebrating Women Composers in the historic surroundings of Ewenny Abbey. The concert includes the world premieres of Hilary Tann's Into the Air and Steph Power's And ante, plus music by Cecilia McDowall, Judith Weir, Chen Yi and Elisenda Fabregas. There is a meet the composer's event prior to the concert with the chance to hear Steph Power and Hilary Tann in conversation. There is something of an American theme running through the festival. One of the guest artists at the festival is the American keyboard sextet the Grand Band and they will be giving the premiere of a new work by Ben Wallace alongside music by Paul Kerekes, Philip Glass, David Lang, John Metcalf (artistic director of the festival) and Steve Reich. During their two day residency, The Grand Band will also be working with composers from The Peter Reynolds Composer Studio, giving a masterclass with students from Cardiff University and giving a primary schools concert. In addition to Onyx Brass's performance of John Adams China Gates, Robin Green and Mei Yi Foo will be performing the complete piano works of John Adams including the UK premiere of Roll Over Beethoven, and the Polish group, Apollon Musagete Quartet will be performing John Adams' John's Book of Alleged Dances in a concert which also includes Krzysztof Penderecki's Quartet No. 3. Music by John Adams also features in the concluding concert in the festival with the BBC National Orchestra of Wales, conducted by Tecwyn Evans with Paul Watkins (cello), Sophie Westbrooke (recorder) and the Apollon Musage Quartet, performing Adams The Chairman Dances and Absolute Jest, plus Huw Watkins Cello Concerto and the premiere of Graham Fitkin's Concerto for amplified recorders and orchestra which was written for Sophie Westbrooke, former BBC Young Musician Finalist and still only 17.